The Leopard Cat (Prionailurus bengalensis) is a small wild cat of Southeast Asia. On average, the Leopard Cat is as large as a Domestic Cat, but there are considerable regional differences: in Indonesia the average size is 45 cm (18 in), plus 20 cm (8 in) tail, while it is 60 cm/40 cm (24/16 in) in the Amur region. The shoulder height is 41 cm (16 in) and the weight is 4.5-6.8 kg (10-15 lbs), similar in size to a Domestic Cat. The fur is also quite variable: it is yellow in the southern populations, but silver-grey in the northern ones. The chest and the lower part of the head are white. The Leopard Cat bears black markings that may be - dependent on the subspecies - spots or rosettes. It has litters of 2 to 4 kittens and the gestation period can vary from 65 to 70 days. The habitat of this feline is forests and rainforests both in low and mountainous areas, but usually not arid areas. 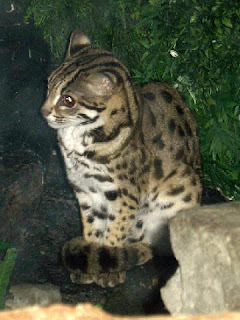 It lives close to watercourses and may be found in heights up to 3000 m. The Leopard Cat can climb trees skillfully. It is also able to swim, but will seldom do so. This cat is nocturnal, and during the day it spends its time in dens that may be hollow trees, cavities under roots, or caves. It spends time out during the day in areas where there are no humans. 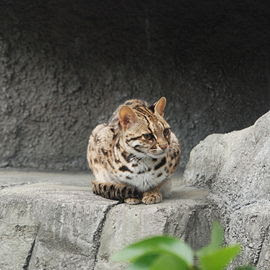 The Leopard Cat is solitary, except during breeding season. There is no fixed breeding period in the southern part of its range; in the colder northern parts it tends to breed around March or April, when the weather is nice enough to support newborn kittens. The estrus period lasts for 5-9 days. After a gestation period of 9-10 weeks, two to three kittens are born in a den, and there they will remain until they are a month old. They open their eyes at ten days old, and start to eat solid food at 23 days. If the kittens are killed the mother can come into heat again and have another litter that year. 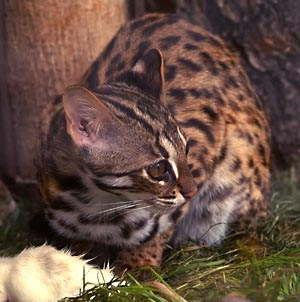 The Leopard Cat hunts hares, birds, rodents and other small mammals, and even bats. When entering villages, it may be a threat to the domestic poultry. he Leopard Cat has been interbred with the domestic cat to create the Bengal cat. In Hong Kong, it is a protected species under Wild Animals Protection Ordinance Cap 170. The population is well over 50,000 individuals and though declining, the cat is not endangered. The Iriomote Cat (P. iriomotensis) was once considered a subspecies of the Leopard Cat and lives exclusively on the tiny island of Iriomote. The Tsushima Cat was estimated to number less than 100 in 1988. First it was regarded as a separate species as well, then as a subspecies of the Leopard Cat, and now as a variety of the Manchurian subspecies (F. b. euptailurus).